"Over in San Benito County there are many small ranches which use more day workers than full-time hands. 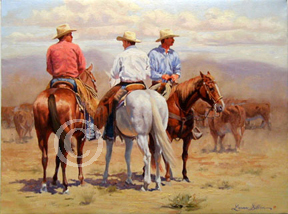 These three have gained much acclaim in the area for their skills working with cattle and can do the work of five men. They are highly regarded and sought out for gatherings and brandings."